Half of the properties at Hartford Homes’ latest development in the south of the Isle of Man were officially reserved within only two weeks of launch. Six of the twelve available plots at Bradda View Grove, which will be located off the Ballakillowey road in Rushen, have now been sold subject to contract. James Greenhalgh, director of the local family-run building firm, said: “The popularity of our properties at Bradda View Grove has been impressive and it shows there is a continuing strong demand for quality new-build family homes. The collection of just 12 detached four and five bed homes will sit in a cul-de-sac at the far end of the existing Bradda View estate with mature trees to one end of the site, giving a sense of privacy and exclusivity. 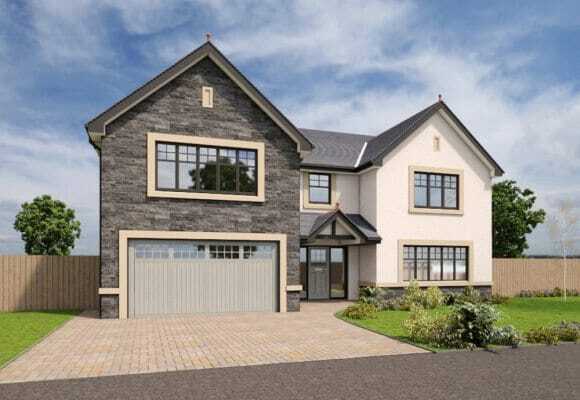 There will be five house types, each designed with classic stone cladding, crisp, white rendering and integral garages. Inside, the homes will feature open-plan living areas, expansive bi-fold patio doors, fully-fitted designer kitchens and stunning specifications including fabulous bathroom suites. Buyers will also have the option to personalise their homes, depending on build stage, from kitchen worktops to floor coverings and even the colour schemes. Work is due to start on site this autumn, with some homes ready to move in to next summer and overall completion presently expected circa the end of 2017. The launch comes as Hartford’s Cronk Cullyn development of 59 homes in nearby Colby nears completion, with only six properties remaining.